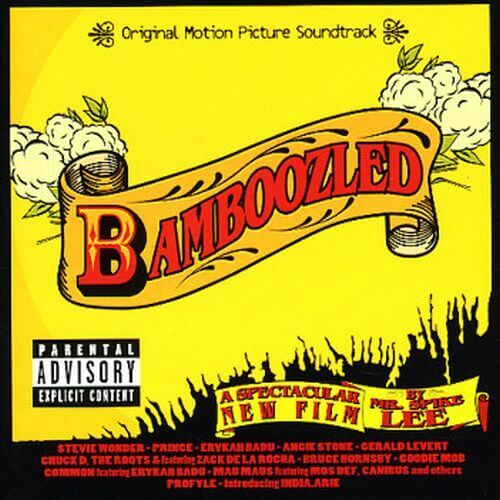 Bamboozled is a satirical film written and directed by Spike Lee, which again leads as only he knows how, showing the situation of black people in the United States. In this case, is a graduate of Harvard University, the only person of color who works as a scriptwriter for a new and challenging television. Despite several attempts, still has not seen any of his projects produced. His boss gives him an ultimatum: if not create a hit TV show will be dismissed. A critique of television stereotypes in which, people of color, seem to have to take the role of jesters. The high affinity of Spike Lee with Stevie Wonder which again leads to it is back on its soundtrack. Sounds hip hop and contemporary R&B by six songs from India Arie, anothers from Prince, Erykah Badu, Angie Stone o Gerald Levert. This time there are two songs written, produced and arranged by Stevie Wonder which add value to the soundtrack, "Some Years Ago" and "Misrepresent People".